#Log the data to a CSV file where versioning size > 0MB! write-host "Versioning Report Generated Successfully!" Generate-VersionSizeReport -WebAppURL "http://intranet.crescent.com" -CSVReport "C:\Temp\VersioningRpt.csv"
Exclude SharePoint's System Lists & Libraries: You may want to exclude Lists and Libraries SharePoint uses for its own operations. E.g. "Pages". Just have a array with all system lists and exclude them from processing. #Get Last Year's Same day! 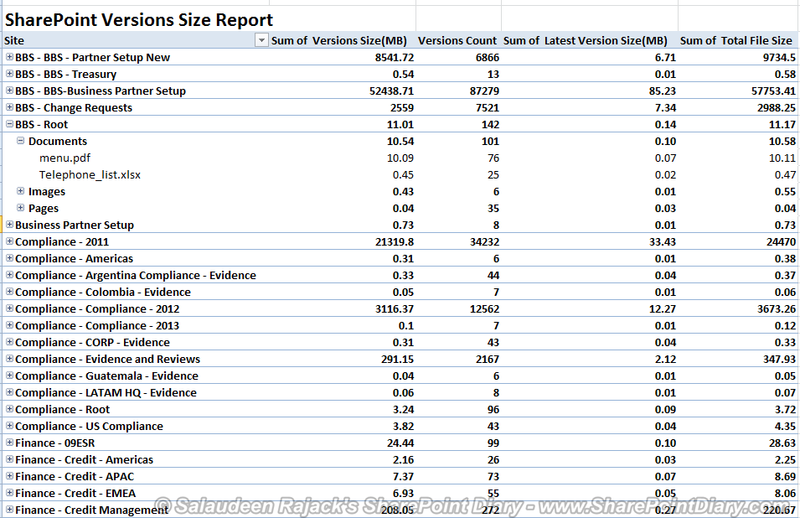 Generate-VersionSizeReport -WebAppURL "http://sharepoint.crescent.com" -CSVReport "C:\Temp\VersionHistory.csv"
Very useful script Salaudeen Rajack, Can we also get the item owner information on the report (A new column on the report that has Users & groups name that has full control access on the item)? Use: $ListItem["Author"] to get the Owner of the Item. pls , help me out , how to run this script in SharePoint Server's Windows PowerShell script? what and all need to change and where i need to include the URL of the Site wher i want my version report from? Hi Salaudeen, thanks for script. The data delivered are exactly what we needed. I just realized that the script does not get all items/documents from libraries. I adjusted the script, so that it runs only through one site-collection. you have any idea why it did not get all items? Thanking you, this works great.